This year's nominees include a number of exceptional titles. Devin Johnston's Sources was profiled in these pages a few months ago, and we have a poem from that striking and now deservedly acclaimed collection below. It's also interesting that Pierre Martory has landed a nomination with the collection The Landscapist (translated by John Ashbery). Martory (1920-1998) was a close friend of Ashbery's while the poet was living in France. 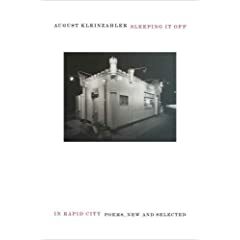 In a quote excerpted on the back of the jacket, Ashbery writes that he realized that Martory's work would likely be forgotten unless he translated it and helped it reach a wider audience -- which he has now certainly accomplished. Again, congratulations to all -- the official NBCC blog reports that "winners of all the awards will be announced on Thursday, March 12, 2009, at a ceremony held at the New School in New York." Our friends at William Morrow have just sent word that Nikki Giovanni has a new collection out this week, called Bicycles. This new book of poems serves as a companion collection to her 1997 Love Poems. "In a career that has earned her accolades, honorary degrees, and awards from both fellow poets and everyday poetry lovers, Nikki Giovanni has established herself as a writer who can entertain and challenge, inform and inspire. Sometimes controversial, sometimes ethereal, but always beautiful, her poems move readers of all hues and generations." Some information on the new Paul Guest from our friends at Ecco. The new book (his fourth) has received this dazzling collection of blurbs. There are a large number of poetry related events going on this weekend in New York through the Poets Forum, featuring poets such as Frank Bidart, Louise Glück, Robert Pinsky, and Gary Snyder, among others. For more information check out http://www.poets.org/page.php/prmID/380. Tomorrow there are 4 different sessions, each focusing on contemporary poetry. It should be a great chance to see many of our top poets discuss contemporary work. "Some of the most important poets of our time explore questions central to poetry today. Participants in the four intimate panels will include Frank Bidart, Victor Hernández Cruz, Louise Glück, Lyn Hejinian, Sharon Olds, Ron Padgett, Carl Phillips, Robert Pinsky, Kay Ryan, Gary Snyder, Gerald Stern, Susan Stewart, Ellen Bryant Voigt, C. K. Williams, and moderators Timothy Donnelly, James Longenbach, Maureen N. McLane, and Tree Swenson." Last Friday publishing legend Robert Giroux (of Farrar, Straus, and Giroux) passed away. He had an amazing life, editing many of the greatest writers of the 20th century, including T. S. Eliot, Jack Kerouac, Flannery O'Connor, and Virginia Woolf. Turtle Point Press has just published an intriguing new collection by Devin Johnston, called Sources. This is Johnston's third book of poems. The below poem, one of my favorites from the new book, discusses this theme of origins as well. Written over a period of 15 years, this is a collection of poems by Persian poet Hafez (a fellow Persian poet to Rumi), by Robert Bly and Persian scholar Leonard Lewisohn. The New York Times has said that "Jorie Graham's poetry is among the most sensuously embodied and imaginative writing we have." Selected work from Doty's seven books, along with a generous collection of new work. yes, but facts are facts. and ten years have passed." Just out is this large collection of work by John Clare. A lesser known Romantic poet, Clare is wonderful. He also had a fascinating and rather tragic life, spending much of it in an insane asylum. But his poetry is full of the beauties of nature and a remarkable and kind spirit. 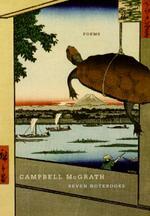 The first volume of a two volume collected series. This is the first time the Library of America has issued a collection of poetry by a living poet, and of course Ashbery is the perfect choice for the accolade. Volume editor Mark Ford (an intriguing poet in his own right) has also participated in a book-long interview with Ashbery called John Ashbery in Conversation with Mark Ford. 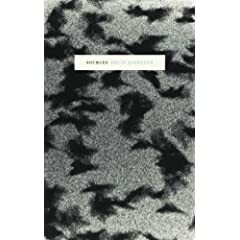 Ashbery's selected later poems, Notes from the Air, will be coming out in paperback in October as well (10/28). A new book by one of America's most popular poets. When I saw him give a talk once he explained how he used to write very serious poetry as a young man, terribly grave stuff, as William Collins. Then he changed his tone, and his moniker, and has never looked back. 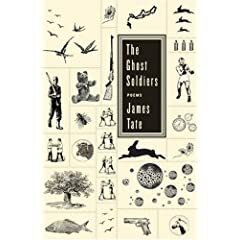 In case you hadn't seen it yet, Pulitzer Prize-winner James Tate has a new book out called The Ghost Soldiers. "It's rare that a poet so far into his career—this is Tate's 15th collection—comes up with something new; quietly, Tate has found a fresh way of telling some of America's stories." and waved to one another. I never saw her again. She went on to become the fi rst woman on the moon. happy, my moonbeam. Every night I’m at my telescope. I’ve seen dinosaurs, snow leopards, fl amingos. dust, that’s all. I never saw the girl again. The tumbled tricycle’s wheels kept spinning. Sleep, I said, sleep, little baby. 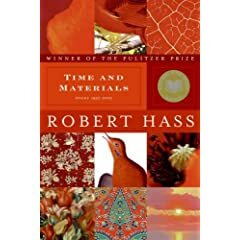 Congratulations to this year's Pulitzer Prize winner Robert Hass, for his book Time and Materials. The book had previously won the National Book Award, so this is quite a feat. Audio of Hass reading his work and reflecting on his writing process is available from UC Berkeley. Read more at Critical Mass. Sharp Teeth now on sale! I went ga-ga about this book back in the dizzle like six months ago. Now it's on sale, living, breathing, changing out in the market place. So keep an eye out for Sharp Teeth by Toby Barlow. And check out the video. Signed book giveaway at www.olivereader.com. Center for the Art of Translation...Party! Also, I'm very happy to read that the University of Michigan's department of English is holding a conference March 6-7 called "Writing in Public: A Celebration of Karl Pohrt," who is founder and owner of Shaman Drum Shop, Ann Arbor, MI. Read more about the even and Karl here. I've been lucky enough to work with him on Reading the World. This celebration is much deserved. I am bad. I should have shown you this sooner. Here is Campbell McGrath's newest collection Seven Notebooks. According to a close colleague at Ecco, Seven Notebooks is, "formally, unlike any other book of poetry, by McGrath or anyone else (almost a novel in verse). It is his most remarkable, and best, achievement to date." Words Without Borders has dedicated the month of January to a discussion of Zbigniew Herbert and the recently published Collected Poems: 1956-1998 (which will be coming out in paperback next month). So far, features include an introductory essay by James Marcus and an interview between Cynthia Haven and Peter Dale Scott. 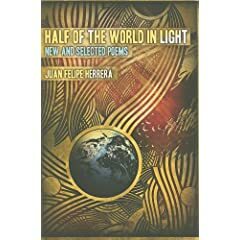 Other notable writers/poets/translators such as Anna Frajlich, Andrzej Franaszek, William Martin, and Alissa Valles will contribute over the course of the month. I'm so pleased that the spotlight remains bright on Herbert since the publication of his Collected. If you haven't yet familiarized yourself with this great poet, here's a wonderful opportunity. -- Henry Wadsworth Longfellow, from Henry Wadsworth Longfellow: Poems and Other Writings, Library of America, 2000. As it so happened, Outre-Mer: A Pilgrimage beyond the Sea by Henry Wadsworth Longfellow (1835) was the first book Harper ever published. The New Year approaches and along with it so does the Cruelest Month's second birthday. Conceived on a muggy winter afternoon, born and reared by the imprint Ecco, it stands, in the twilight of 2007, on a crumbling precipice. Where have the posts been? Will the sounding of the New Year also ring the final tolls for this happy little blog? I aver that I don't know. Maybe, maybe not. Possibly. But possibly maybe. Not that you require me to justify myself, it's only a natural reaction when one knows what they should be doing and they aren't. I think they call that a sin of omission. But let's hope I manage, for your sake and mine, that I keep the posts worthwhile. Is this post worthwhile? Well, it's just got to be. Anyway, I wanted to thank everyone who has stayed up with the site. Thanks for all your wonderful comments and enthusiasm for poetry and literature. I look forward to all that comes next...with us...together in a committed relationship...sharing everything. I've lifted this from a post on Paper Cuts, where you can find more information on the paintings and the video's creator.